It all started as a trip to the Zythos beer festival in Leuven but I’d had the foresight (with hindsight) to book an ‘Any Belgian Station’ Eurostar ticket and the more I thought about spending quite a number of hours at the festival, the less sensible an idea did it seem! At the same time, I realised that the Germans had, once again, been re-opening lines in Nordrhein-Westfalen (not all that recently but my eye had been off the ball again). Two and two were put together and a lot of timetabling done, resulting in the realisation that with fairly minimal extra expense I could stay one of the two nights in Aachen and the other in Leuven, do some worthwhile track in NRW and still get to the ball, or at least the beer festival. First outing for a while, the plan being to do some German reopenings, and the Zythos beer festival in its new venue at Leuven on the way back. All well to London with a refurbished ATW 158 to Birmingham New Street where building work is beginning to intrude. I suppose it’ll be better in the end, since it couldn’t really be worse. A delay-free run down to Euston as well, on one of the new ‘make you walk further’ lengthened Bendyleanos. Memo to self: never again coach A, it makes me feel ill. Along to Kings Cross on the ‘bus for a look at the new concourse which I found deeply underwhelming. It looks better in the photos. Thence via the ridiculously pricey Euston Flyer (“Gale’s” (Fuller’s) Spring Ale, nice but not for £3.75) to St Pancras for the Eurostar. Two or three minutes to check in and do the bag scan, then the long wait to go. Doors closed at 12:55 for the booked departure at 12:57 and we were away a few seconds early. Slightly late away from Lille I think (also stopped at Ebbsfleet and Calais) so the connection at Brussel Zuid is looking very dodgy. [It was less than 20 minutes]. All is not lost though, if I can get away quickly enough. But it was. The Eurostar after a fine thrash was only 4 late and I was in plenty of time for 16:24 Li¬ège. 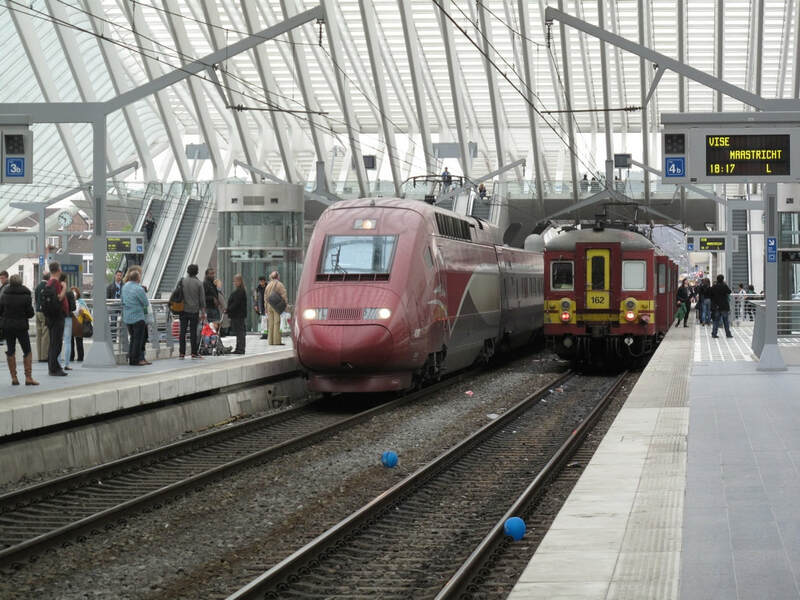 SNCB/NMBS were in total chaos on the stretch through Brussels however, and at the time of writing we’re stationary outside Brussel Noord having left there 25 late. Assuming the Eupen train is similarly delayed that means 2 hours late into Aachen as I’ll miss the bus connection in Eupen. It was, 30 late for an 18 minute bus connection. So off to the friterie for some supper and then the pub for – can you believe it – Leffe Blonde au fut (or van ‘t vat). Plan C is the 19:33 stopper to Aachen and straight to bed pending the 04:13 start tomorrow. Harrumph. Plan C it was, and to add insult to injury they held the Aachen stopper for pax off the 18:24 Brussel Zuid-Visé which was 12 or 13 late so it was delayed 5 minutes or so in all. Terrible old Belgian EMUs (rear one was 156) and wedged into the bargain, with most going through to Aachen, surprisingly. I’d taken the precaution of buying a single from Hergenrath (last Belgian station) to Aachen on line so I didn’t have to bother about the gripper (and he didn’t bother about me either – but I’d have been legal if he had). At Aachen I got tomorrow’s NRW-Ticket from the machine but I couldn’t get it to book me back to Hergenrath. A 20 minute wait in the Reisezentrum was required but it may well stand me in good stead tomorrow. Over to Stadt-Nah (reception in Hotel Bahnhof) where I had to pay cash because Young Bert couldn’t remember the password for the credit card terminal. Other than that all seems OK. 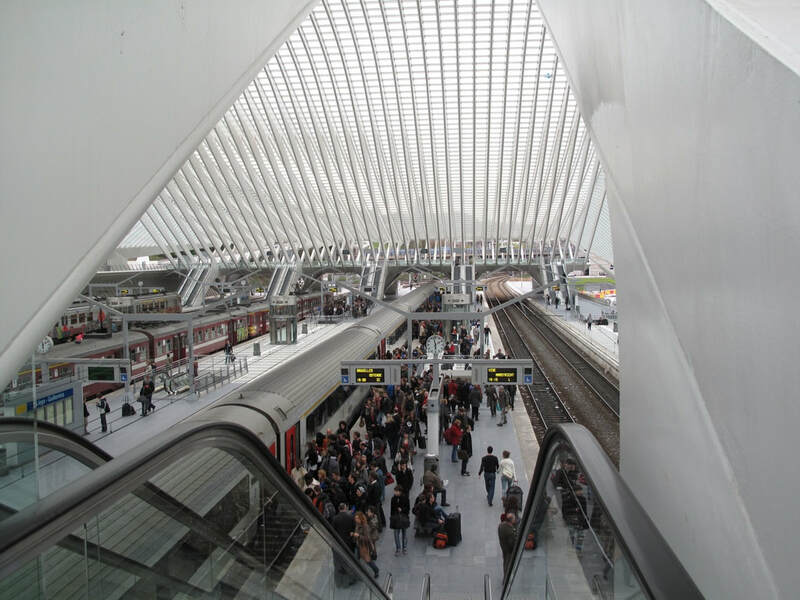 The striking interior of the new Liège Guillemins frames the 18:00 to Oostende on 27.4.12. 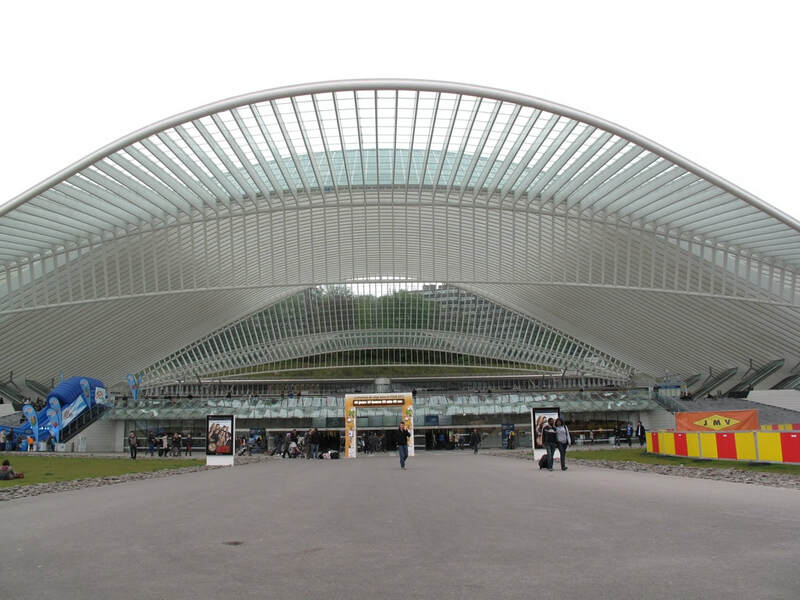 The equally impressive exterior at Liège Guillemins, spoiled only by extraneous clutter, 27.4.12. Up early if not bright, to stagger across the road to the Hbf (very convenient, the Stadt-Nah) for the 04:13. Arrived at 04:05 and watched a container train go through, immediately followed by 111 113 with a set of Dostos for RE10403. It left at 04:13 to the second. Connection from Mönchengladbach to Dortmund was a 421 or some such. Did the job anyway, with a slightly foggy dawn breaking around Krefeld. At Dortmund several hundred (literally) beer-carrying young persons had stripped all the bakery stalls – and McD’s didn’t have a breakfast menu. So I had to make do with a mayo-stuffed ham/cheese salad roll and a bucket of coffee. Much better than nothing though! 07:23 Winterberg was a pair of ALFAs – marginally more comfortable than the 42x though with a tooth-rattling vibration when powering. It was in early and provided somewhere clean and comfortable for breakfast and a shave! 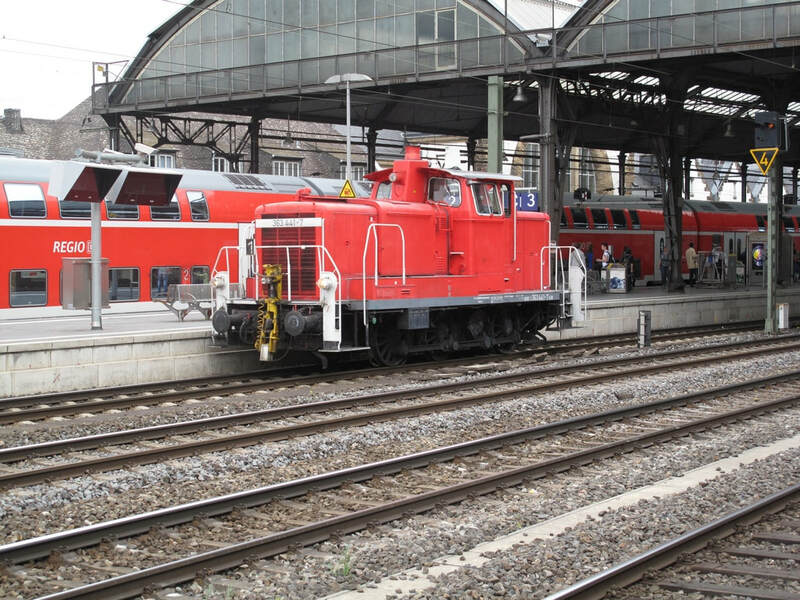 No through trains to Brilon Stadt on a Saturday morning so a 10 minute break at Bestwig to await a SULFA which emerged from the stabling point to work to Brilon Stadt. A nice little (half) branch it is too – looks as if it may still continue beyond Brilon Stadt for freight. 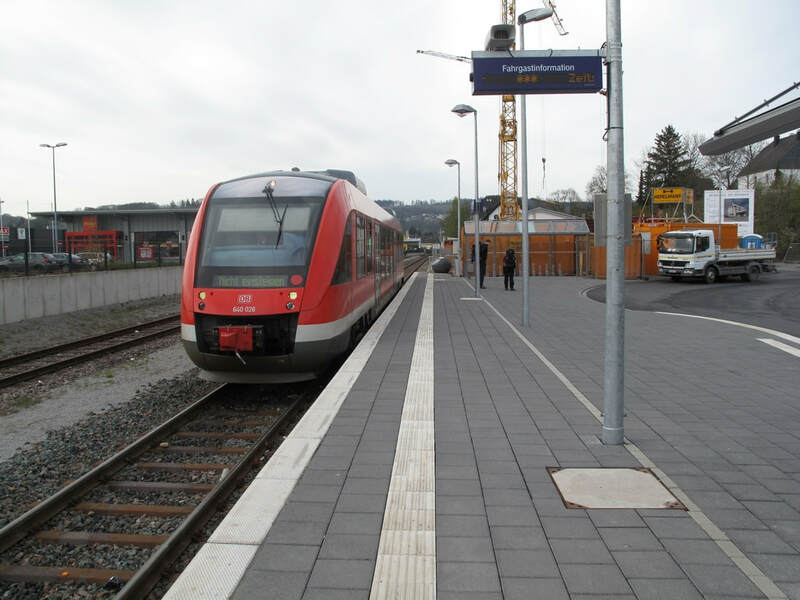 At Brilon Stadt there’s a new platform with ‘bus interchange. The old goods shed is being imaginatively converted into offices – sadly there’s a rather less imaginative 5-storey block being added to the north end which will spoil the effect somewhat. Strange shunting antics at Brilon Stadt as the Bestwig single unit was removed to the south end of the run round loop. The reasoning became clear when a twin unit arrived from Kassel, however. This set back to just short of the level crossing, the Bestwig 640 returned from the run round loop then the Kassel train was stabled in the loop so that the 640 could run through. 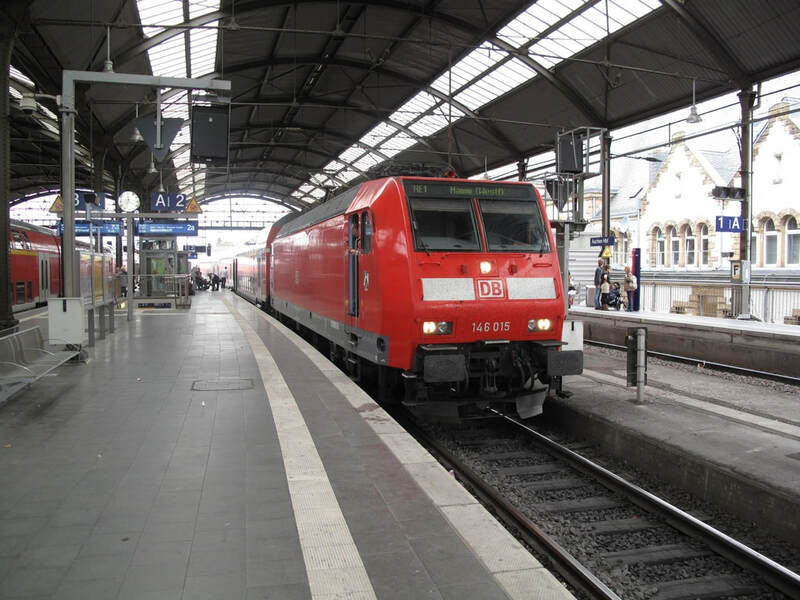 Back to Bestwig on time, then everything went awry again as the RE back to Dortmund turned up 12 late (maybe a little more) which didn’t bode well for my 10 minute connection from the bay P2 at Dortmund Hbf to my departure platform right over on the north side. The gods smiled at last however, and I made it by 2 minutes. Off to Duisburg on a packed RE1 which ran meticulously to time as far as Mülheim then contrived to lose 5 minutes over the last 5 minutes to Duisburg. With 16 minutes that didn’t matter though, and I caught the even more packed RB (Borussia Mönchengladbach were playing at home, allowing any amount of sociological observation) to Herzogenrath. This one ran around 4 late most of the way but again I had a 16 minute leap so there was no problem. Surprisingly the Euregiobahn was a pair of 643s – I’d only expected one. There was quite a bit of patronage at least on the Herzogenrath – Alsdorf Poststrasse section. 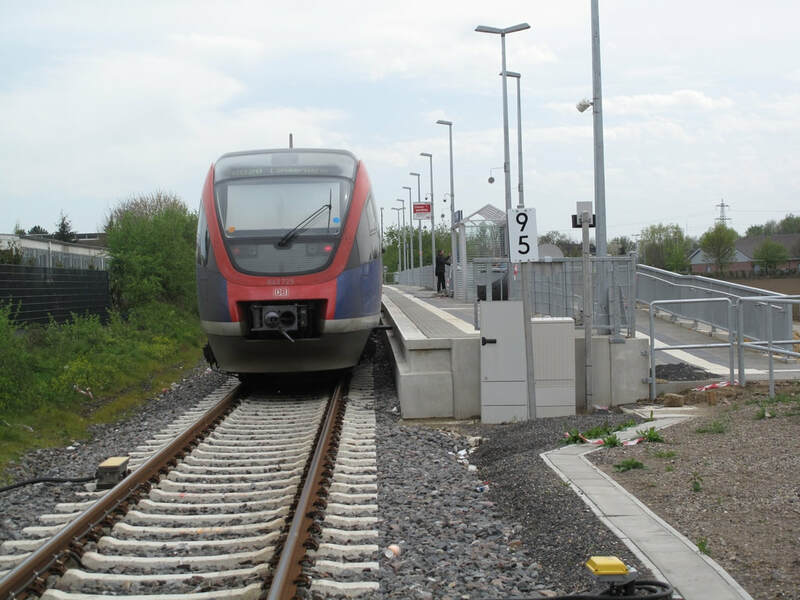 The line has recently been extended from Annapark where there’s a passing loop of considerable length, with a connection into some sort of museum/preservation site at Wilhelmshacht, just east of Alsdorf-Busch. 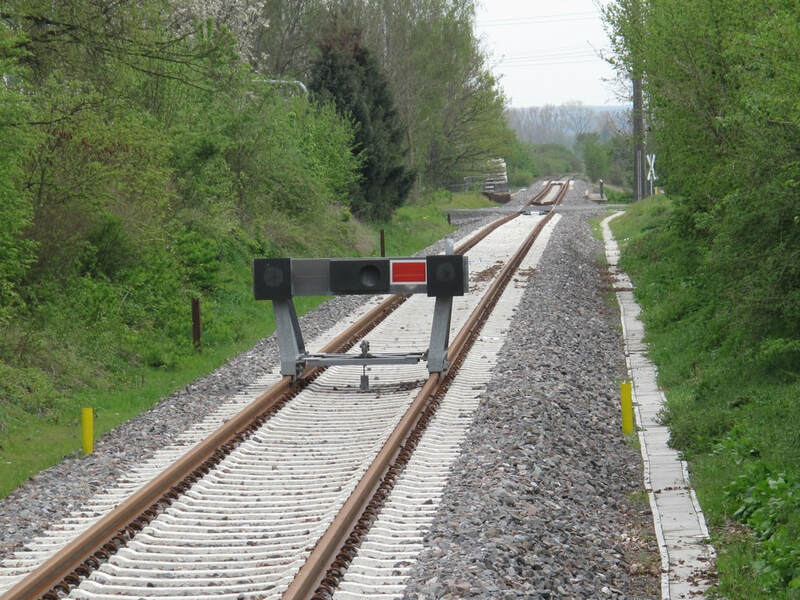 New track extends beyond a temporary buffer stop at Poststrasse and it seems safe to assume that extension to Eschweiler (?) is in hand. [Correct – it is, due to open in December 2012 (2018 update : but didn't)]. Completely uneventful to Leuven – a couple of trains were half an hour or so late at Liège, including the Eupen service which would have returned as the 19:00 ex Liège, an hour after mine. Mine was on time however, and just under a minute late at Leuven (18:33 booked). The Etap is at the top of a precipitous flight of steps a few metres from the east end of the station subway, so pretty convenient. I managed the 19:00 free ‘bus to the Zythos beer fest at the NEC, sorry, Brabanthal. It’s about as attractive as the NEC, i.e. not at all, but there’s more room than there was at St Niklaas. A good event again, though in the interests of survival I could only scratch the surface of the list of 300 beers. Homework paid off as usual and a good if modest sample was taken. Back on the 21:45 bendy ‘bus with a very merry throng – roars of approval every time it went round a corner or stopped! 640 026 stands at the new rail/bus interchange at Brilon Stadt on 28.4.12. Euregiobahn DMUs stand at Altdorf Poststrasse, 28.4.12. 363 441 passing through Aachen Hbf westbound on 28.4.12. The locusts had already descended on the station Panos at 09:30 so I wandered into town for a toastie and a coffee at Subway (what dreary shops they are) before a bit of sightseeing and photting. Couldn’t go in the cathedral unfortunately, it being 10:15 on Sunday. And so to Domus, the brewpub, and very nice it is too. Tried (in small measure) both house beers, whimsically named Nostra Domus and, er, Con Domus. The former resembles an ambrée, not particularly to my taste; the Con is a fairly run of the mill pilsener, allegedly unfiltered but surprisingly clear. Hoppy, too. Thence back to the station for the 11:57 Blankenberge/Knokke IC with 2748 powering. I’d decided to go very early in view of the chaos on Friday and delays on Saturday. Still moving at the time of writing after a very slow stagger from Diegem to Schaarbeek. Only 6 or so late at Brussel Zuid in the end so it was quite a long wait for the Eurostar punctuated by a visit to the burger bar and to Carrefour for some beer and cheese. Faultless Eurostar journey arriving 1 minute early – forewarned by the Railway Herald of immigration queues at St Pancras I made sure I was well placed on arrival, and from a scheduled 16:04 arrival was in the Bree Louise for a restorative pint by 16:13. There followed VT’s 16:38 to Birmingham Irrational and the slightly delayed (2 minutes) 19:07 ATW therefrom to Telford. VT had my reservation backward facing with no windows as usual so I sat elsewhere. ATW failed completely with reservations (and we’re currently stationary in the Proof House Force Field so that 2 minutes might expand). Only to 3, so arrival back in a rain soaked Telford was 20:02. All in all quite an interesting trip though I could have done without the Belgian fiasco on Friday. I'd missed several odds and ends in Baden-Württemberg recently and it took very little for me to convince myself to go back to Germany for another go, which I did in May 2012.